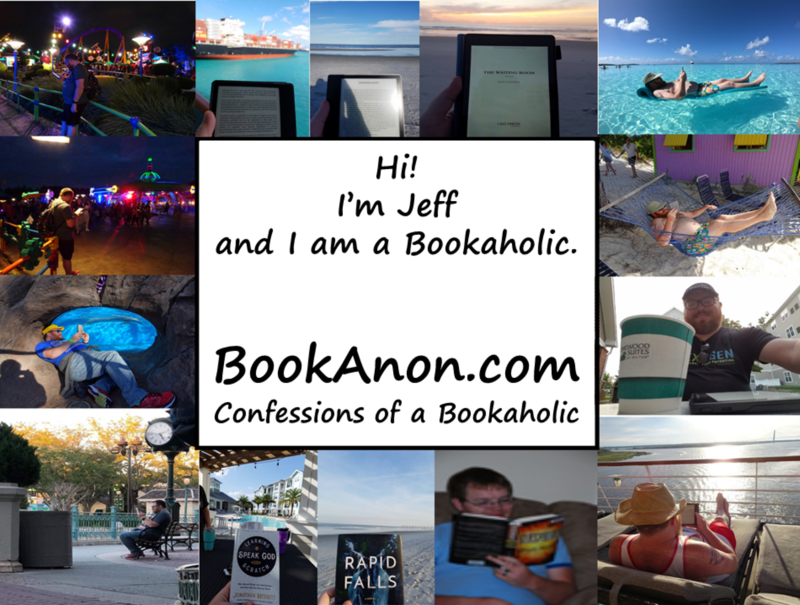 BookAnon.com: Confessions of a Bookaholic – Page 2 – Hi! I'm Jeff. And I'm a BookAHolic. Today is World Autism Awareness Day, and this book blogger is Autistic… and a publisher of an Autistic author that writes about Autistic characters. In celebration, and to try to raise some awareness of at least some excellent books featuring Autistic characters living fairly realistic lives, let’s look at some books featuring Autistic characters, shall we? First up is the first book I ever really saw that featured Autistic characters well. This is The Spectrum Chick and The Spectrum Chick II by Janey Klunder, and these are two of the books I have published myself via KDP. That said, I have no direct stake in their success – I’ve never made a penny from them and I never will. 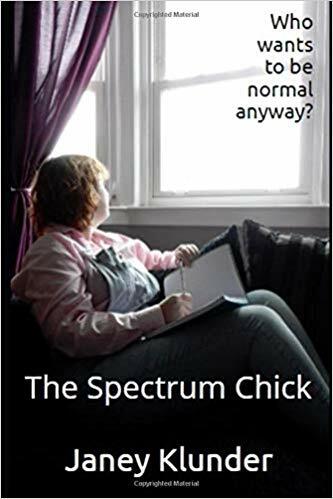 These books begin with the day a young twenty something Scottish lass first hears the word “Asperger’s” and follow her throughout the next few years of her life as she learns that a word just gives you an easier way to communicate something that has always been a part of you. Janey happens to be Autistic herself and shows the perspective of female Autistics well. 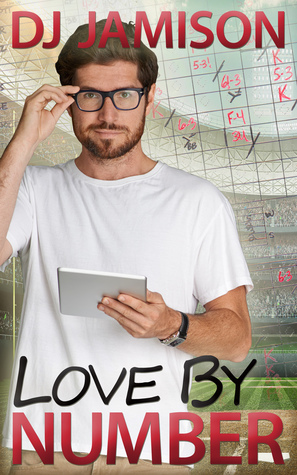 The next book was my introduction to a new author I’ve since come to enjoy – DJ Jamison’s Love by Number. This was a book where an overprotected Autistic young man finds love after a car crash in the parking lot at the ball park, and it portrayed the hyper focus we can get in particular very well – for its strengths and weaknesses. DJ is a mom of an Autistic, and far more open to our struggled and victories than many “Autism parents”. 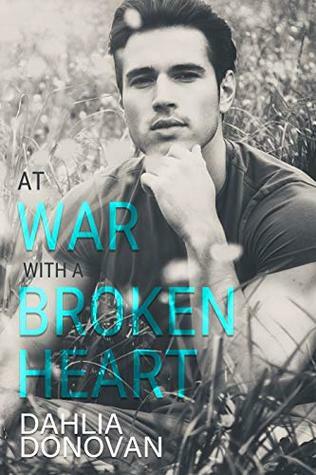 Finally, I want to highlight At War with a Broken Heart by Dahlia Donovan. This is another gay romance, though this one happens to be a polyamorous gay romance to boot. 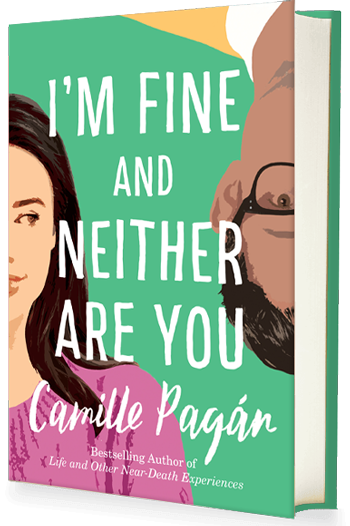 I read an ARC of this particular book back in February, and its depiction of its Autistic main character (and even his brother, who is also Autistic but mostly off screen) was so spot on that I almost knew the author had to be either Autistic herself or have a very close family member that was Autistic (ala DJ, above). As it turns out, Dahlia too is Autistic. Brilliance by Marcus Sakey, which features people with superpowers – and these superpowers are all based on their Autistic traits, in a “next level of evolution” kind of set up. The entire trilogy is simply excellent. The Eye of God by James Rollins is fairly deep into his Sigma Force series, but features a group of Autistic kids as a driving narrative – again in almost a “next level of evolution” kind of way. This week we look at a fiction book that covers some real world scenarios in such a realistic manner that it could almost be said to be a self help book. 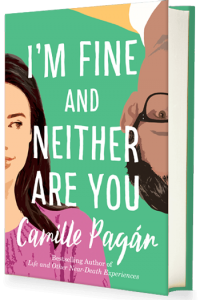 This week, we look at I’m Fine and Neither Are You by Camille Pagan. Honestly, this book was one of those that struck so very many chords once it really got going. While setting things up the book was somewhat focused on the couple’s kids, which was throwing this childfree reader a bit – just isn’t something I personally relate to, and thus a bit harder for my mind to get into that kind of story. But then the book got into the meat of its story. I don’t think I ever even read the blurb for this book, the title alone was intriguing enough to get me to read it, so I don’t want to discuss too much here that could give away key plot points, but let’s go in with some things that really hit home for me: Like one character in this book, I am obviously a blogger. What is less obvious on this site is that I’ve been doing it for a decade now across a few different topics, and while I don’t have near the reach the blogger in this tale did, the fact that we have that similarity alone was enough to begin to draw me in. Then the dynamics between the husband and wife here. I’ve seen myself on both sides of the discussions raised throughout the remainder of the book after a certain key event, and to say this dynamic hit home is a bit of an understatement. Ultimately, Pagan here has written a tale that will be readily identifiable to many and has done so in an extremely realistic manner. This is one of those books that can at times be uncomfortable in its uncanny reality, yet by the end gives a supreme catharsis. Sometimes, those are the best books around. This one certainly feels like one of those. This was yet again a new-to-me Lake Union author, and I’ll be looking forward to Pagan’s other work. Very highly recommended. Over the last couple of weeks, a couple of different outrages have been ravaging the book world. In one, a romance publisher that published predominantly non-white authors shut its doors claiming low sales, while a particular seller claims that sales of non-white authors’ books account for 60% of its bestsellers. In the other, at least one author is complaining about the amount of physical bookstore shelf space dedicated to the works of J.R.R. Tolkien. These controversies wouldn’t normally seem to be linked, but in the era of self publishing they most certainly are. In the era of self publishing and in the new freelance economy, quite honestly the Mega Publishers don’t have the stranglehold on the market they once did. There is no doubt that they still hold considerable sway, I’m not denying that reality at all. I am simply noting that in this new era, one does not have to possess the ability to churn out hundreds of thousands of printed books and distribute them to a worldwide network of physical stores to be able to publish a book and have it do well enough to support an author. Indeed, in my near decade of being Kindle exclusive, I have read literally hundreds of books – over 400 verified books in just the last 3.25 years alone. While I do not keep track of the actual publisher of the books I read, I can tell you from having run experiments trying to find them in my local brick and mortar stores that such stores normally only carry about 10% of the books I’ve read. Using the 400 number, that means that I’ve read 360 books in 3.25 years that you will never find on a shelf of a physical bookstore. And since my average lifetime rating on Goodreads is around 4.8 stars, it is rare that I find a book I don’t like. So clearly there are many quality books out there that don’t find themselves on the shelves of at least the physical bookstores I have checked. But what about the actual controversies? Should publishers make a concerted effort to publish minority books or books featuring minorities on the covers? Should physical stores devote less space to legendary authors in order to give a wider range of authors a chance? I’m not going to directly answer those questions, as I think they are actually irrelevant. If I see a particular group not being served well enough, is there a chance to make money myself by serving that group? If I see a particular small subset of authors dominating a particular space, is there a way to make money by highlighting other authors in other spaces? Ultimately, for authors and publishers in particular, the book business is indeed a business. Yes, you want to create things you are proud of, but you also want to be able to feed your family with the money you earn from people paying for your creation. And so that means that you have to find ways to do that – which is why these controversies exist. The thought there is that these authors are owed these publishers or shelf space. Instead, why don’t we seek out alternatives? Invest in or create new publishers that serve these particular niches. Invest in or create new marketing companies to push these books just as hard as the Mega Publishers’ internal marketing personnel do. Figure out exactly how they operate – and it isn’t exactly a secret – and figure out ways to undercut and oversell them. Any elephant can be eaten one bite at a time, no matter how big or ornery it is. And the Era of Self Publishing, the freelance economy, make all of this possible. We see it every day. 20 years ago, the taxi cab companies were the only real way to get around many urban areas. Getting in with them was a pain, but nearly instantly rewarding. Now with the rise of Uber, Lyft, and others, far more people can provide cabbie services far more effectively… and the cabbie companies of old are falling. Why can’t the same thing happen to the Mega Publishers? Are authors any less creative than Uber drivers? Can we not find some way to undercut the Megas? Wait a minute. What if I as an Autistic began publishing Autistic authors via Kindle Direct Publishing (which now includes CreateSpace for actual printing of physical books)? Could I get an author published that a Mega might never take a risk on? Oh yeah, I’ve been doing that far longer than I’ve been operating this site, and almost longer than I’ve been reviewing books. And I’m open to taking on more authors. I’m open to showing you what I know so that you can serve your community just as I serve mine. I relish the opportunity to help others – and to compete with them. There is more than enough money to be had in the book space for all of us, there is no real reason to hoard knowledge or opportunity. And there is no reason for outrage that someone else isn’t doing something that you can do for yourself with a little hard work. 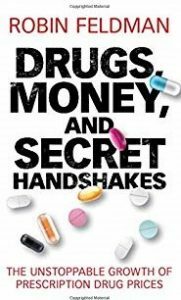 This week we are looking at an eye opening klaxon call warning us of the inner workings of the drug industry in the US. This week, we are looking at Drugs, Money, and Secret Handshakes by Robin Feldman. Quite simply, if you are an American reading this and you only read a single book between now and the November 2020 elections, it needs to be this one. Fully 46% of the edition I read was bibliography and index – that is how well documented this treatise is. Indeed, at times it seemed that literally every sentence Feldman wrote had a footnote marker at the end of it. And what she documents here is simply astonishing. I think many of us have suspected various pieces of the problem for quite a while, and indeed reform efforts as long ago as the mid 80s, when I was a toddler, have sought to correct some of what is described in this book. But as Feldman points out, many of these reforms have only exacerbated the problem rather than solving it. Feldman does an excellent job introducing the problem in Chapter 1, spends chapters 2-4 detailing the problem from multiple perspectives, discusses an actual study of the problem she executed in chapter 5 – which is astonishing in its own right and not to be missed – and finally details some potential solutions in Chapter 6. It is refreshing that she explicitly states in the introduction to Chapter 6 that many of her proposals won’t be politically palatable and so gives a range of options from possibly politically palatable yet likely ineffective to almost a third rail of politics yet could likely actually solve the issue. If this book gets the discussion it deserves, it will likely be a driving force in at least some of the 2020 campaigns, and it deserves to be. Feldman truly does a superb job of documenting and explaining her case, and I look forward to seeing where this goes. This week we are looking at a frenetically paced Christian self help book that contains a message many need to hear. This week, we aer looking at Optimisfits by Ben Courson. 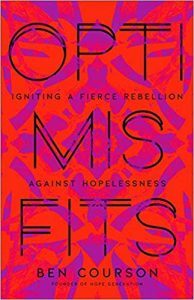 This book was truly a frenetically paced manifesto of radical hope by clinging to nothing but Jesus Christ. At times, the wording evoked images of being shouted through a megaphone. The overall tone felt like a cross between WWE’s Mojo Rawley and his “All Hype All The Time” gimmick crossed with Canadian rapper Manafest’s breakout single “No Plan B” from several years ago. Courson does a great job explaining his philosophy and even references quite a few legendary Christian thinkers, from CS Lewis to G.K. Chesterton, and his message is one that should resonate in self help and Christian millenial/ GenX circles in particular. The book as a whole is truly a great work, but there were a couple of problems with it. For one, Courson relies a bit too much on cliche catchphrases, liberally sprinkling them across nearly every chapter of the book. Another is that he proof texts quite a bit, though he also does a solid job of explaining several Biblical stories in more modern language. And the final problem is a general lack of citation. Given how much Courson makes some claim about something someone said and then just moves on with his point, a hearty bibliography and footnotes would generally be expected… but were not present in the Advance Reader Copy edition I read. Perhaps this will be better presented in the full publication edition, in which case this particular criticism would be rendered moot. 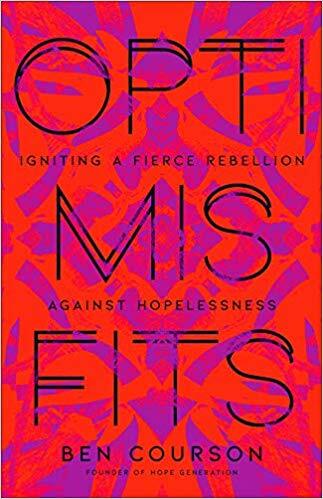 Overall this was an excellent introduction to a new to me Christian speaker and thinker, and I’ll likely be paying a bit more attention to future efforts from this author and recommend that you both pick up this book and check out his other efforts. Finally Forever. This book has all the feels and hijinx of a novel length Red River Valley tale, but in shorter novella form – though closer to 80 pages or so, rather than the 13 pages Goodreads currently claims. To put that in a bit of perspective, Goodreads claims that the previous book in the series was 318 pages – making this one roughly 1/4 the length of the previous one. And honestly, just as good. We already know both of these characters and their issues from being secondary characters in previous books, so this one can and does ignore all of that setup that the previous books required for their couples. Instead, we get the more or less straight relationship stuff, beginning with where we left this couple before and progressing to a happier ending for them – their forever. Very much looking forward to where Alexander takes this series next. This review of It’s In His Forever by Shelly Alexander was originally published on March 12, 2019. Fur-ever Home. This was an excellent story that also served as a potential launching pad for a new series, and it executed both brilliantly. Samir and Luis come from opposite ends of the economic spectrum, but are both highly damaged in their own ways. Roland does a superb job of showing these two come together to heal the other via the power of love, and dog lovers in particular will love the idea of a rescue shelter being central to this series. Very much looking forward to more from this author and in this series. This review of Forever Home by Blake Roland was originally published on March 7, 2019. Virtually Perfect. In this continuation of Dallen’s new #GeeksGoneWild series, we open up at the very same point the first book does – the Labor Day Weekend party that created the hashtag and all of its subsequent fallout. But then we quickly skip ahead to after the events of the first book, so this book *can* be read standalone, but it does have expected spoilers… and one MAJOR reveal that has been a question for nearly two full books at the time it is revealed here. The story is typical Dallen – light, sweet, and fun, with just enough angst and drama to keep things moving. And while this professional software developer that moonlights as a reviewer and blogger was hoping to see a bit more actual coding, coding generally was presented in a somewhat real world (if amateur – these kids *are* high school students) setting, and that alone makes it different than many books out there. Excellent continuation of the series, and I’m very much looking forward to the conclusion! This review of My Virtual Prince Charming by Maggie Dallen was originally published on March 6, 2019. Beware Hitchhiking Ghosts! In this sequel to Ghost of Himself, we come back to Jude and Cope’s slow-burn romance as it continues to slowly burn, but with some pretty significant developments here for Jude in particular. All of this happens against the story of a mysterious Woman in White who is haunting and even outright harming a 15 yo boy. And yes, there are hitchhiking ghosts involved as well – including ghost HTML in my read through! Excellent story yet again, and I’m very much looking forward to coming back to Jude and Cope in their next adventure! This review of Ghost Story by Pandora Pine was originally published on March 5, 2019. Amazing Adventure. In this second outing of the Omega Team, Chesler pairs taut action sequences with stunningly beautiful set pieces… and manages to toss in a couple of points to ponder as well. Even though it is Book 2, it can absolutely be read first, as virtually nothing from the first adventure is spoiled in this book other than the basic setup of who the adversaries are on each side. Fans of Clive Cussler or James Rollins should enjoy this combination of sea and historical mystery with globe spanning action and adventure, and I for one am looking forward to the next entry in the series! This review of Ark Found by Rick Chesler was originally published on February 27, 2019.